This recipe for Melted Witch Pudding Parfaits is a part of the #SnackPackMixins campaign and has been compensated by #CollectiveBias. As always, all opinions are my own. This is my absolute favorite way to eat pudding.. in a parfait and with a dash of melted witch mixed in, who knew a melted witch would be so tasty! 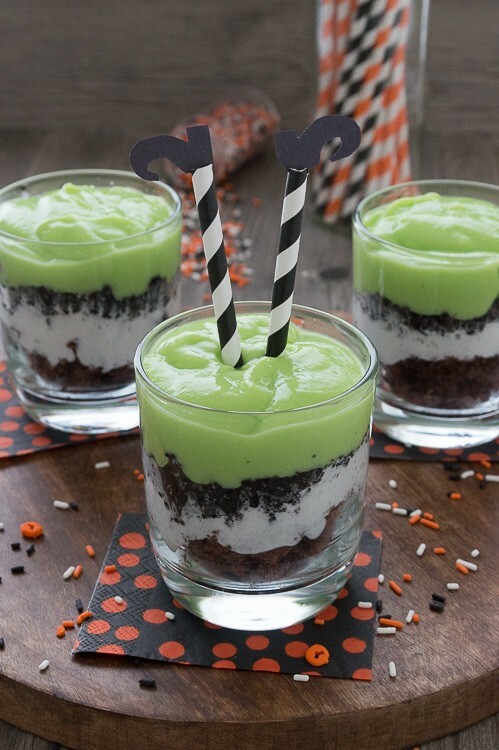 And by a dash of melted witch I mean this parfait is completely loaded with green pudding and my favorite mix ins – oreos, whipped cream, and brownie pieces! 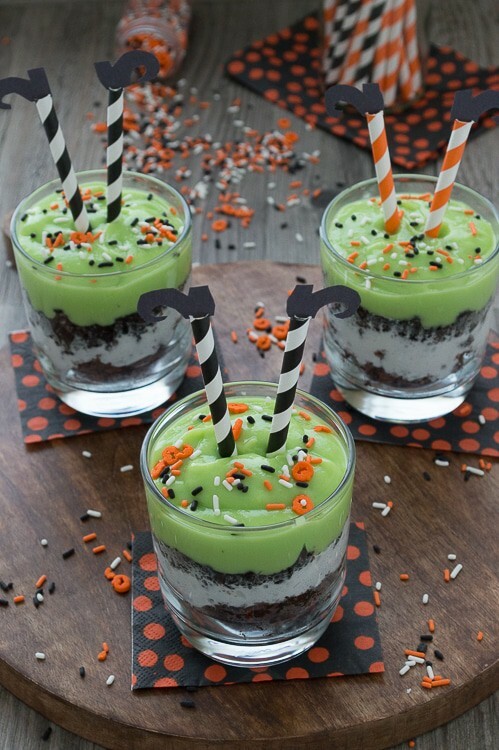 These Melted Witch Pudding Parfaits are sure to be a big hit at any halloween party. Or if you’re like me, this would be a fantastic treat to make before halloween to get you excited for October 31st. I picked up everything I needed to make these parfaits, including the straws, at Walmart. 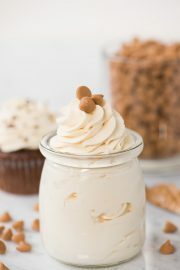 Snack Pack pudding cups are the star of this recipe because they taste great and contain the same amount of calcium as an 8 oz glass of milk. 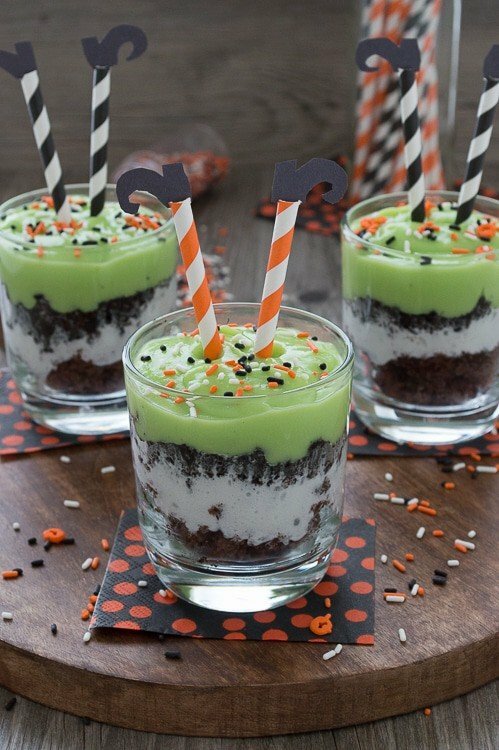 To make these melted witch parfaits you will need vanilla Snack Pack Pudding Cups, green food coloring, brownie pieces, whipped cream, oreos, and halloween sprinkles. To make the witch’s legs will you need paper straws and black paper. To make the witch’s legs, you will need two paper straws and two black shoes for each parfait. Cut your paper straws, making your witch’s legs your desired length – mine were 4.5 inches long. Something to note, you don’t want to cut your witch’s legs too short, otherwise you won’t have enough straw to stick into your parfait. On one end of your paper straw, use a knife to make two small slits across from each other, this is where will you put the shoe. Repeat this process until all the legs are assembled. These halloween pudding parfaits can be assembled fairly quickly, especially if you already have baked brownies on hand. 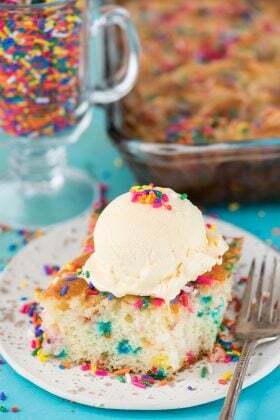 This is a great recipe to get your kids involved with, I am sure they would love watching the Snack Pack Pudding change from vanilla to a witchy green. For the witch's legs you will need paper straws and black paper. See directions in the post to assemble the witch's legs. 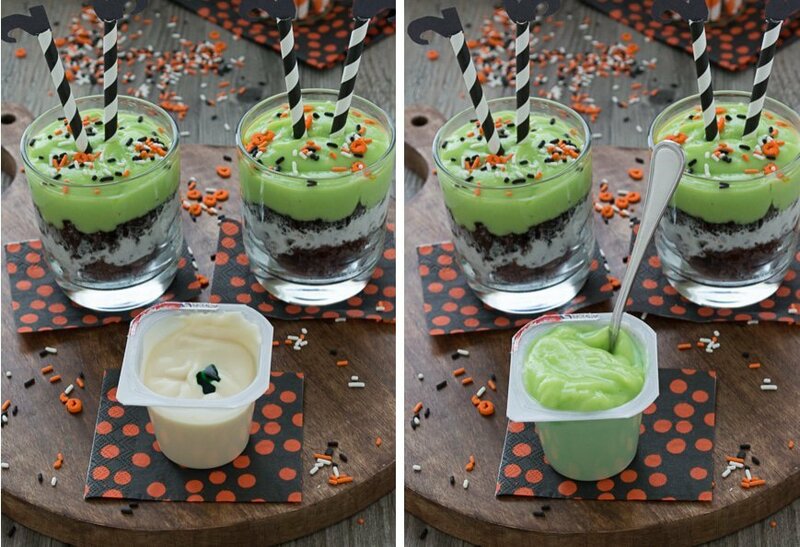 Dye the vanilla Snack Pack pudding cups green. This can be done in each individual pudding container or transfer all of the pudding to a bowl and then add the green food coloring until you get your desired color of green. Set aside. To assemble the parfaits, begin to layer brownie pieces in the bottom of each glass. Divide the brownie pieces evenly among the parfaits. Next, add a layer of whipped cream to each parfait (like Reddi wip). Add the crushed oreos on top of the whipped cream layer. Next, spoon the green Snack Pack Pudding on top of the oreos, filling each glass full. Watch out for the witch’s hat and broom, you never know if they could turn up inside the parfait! 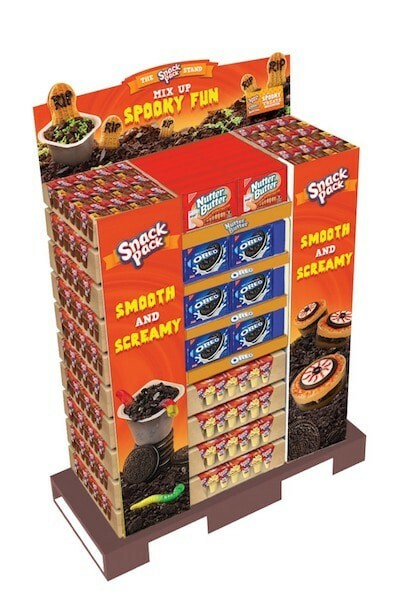 What a fun idea – I love Snack Pac’s and how convenient they are! I find myself eating more than I should :) but they’re so good, especially as these parfaits! So cute! I cannot get over those adorable little witch legs. These are adorable!! My kids would love them! Oh my Gosh… they look so cute! Love, love, love them!!! 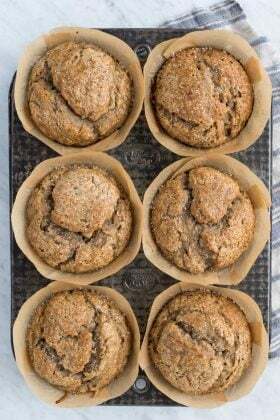 I love reading your blog; you are always so upbeat and cute, and your recipes are user-friendly and fun. One question: how do you cook so many yummy things and stay so thin? I love them too Kelly, thank you! Oh, thank you Renee! I appreciate your sweet comment! 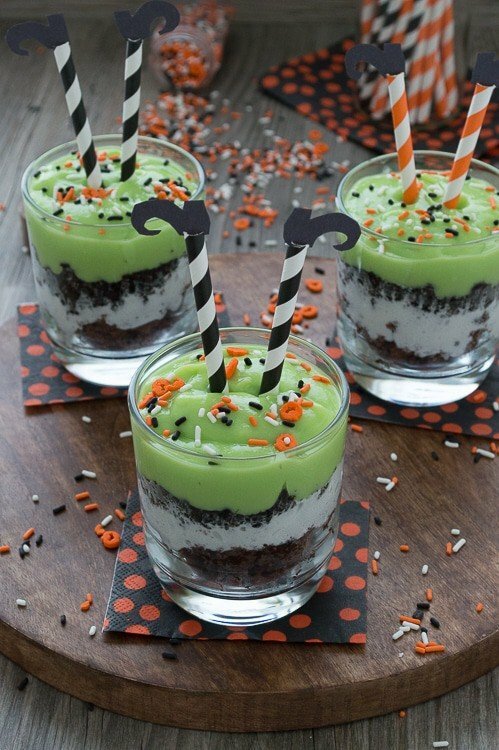 This is seriously the cutest Halloween dessert recipe I have ever seen. I’m making this for my kids this week. Thank you so much! Oh gosh, thank you Christy! I wish I could come and join in on the fun! Seriously so darn cute! Do you think they would just as cute when my husband pulls these from his lunch at work? I think so…ha! 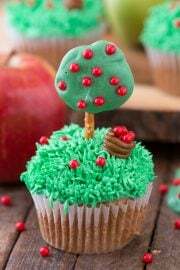 Almost to cute to eat! My kid would love them. Beth, these are so cute and fun! My kids would love these…and so would I! Super creative. Pinning! Thanks for pinning this Serene! These are ADORABLE Beth!!! Love it! Gosh, you’re making me blush Karen! Oh gosh, you’re so sweet, thank you Laura! I just saw this on Facebook and came over to pin it. So so so cute! Rosey, you made my day – thank you! Just adorable! Would be great at a party! Coming to you from Freedom Fridays and sharing on my SM! I appreciate you coming by Cathy, thank you! These are so fun. My kids would love them :) Pinned! I am sure they would think you’re the best mom ever Jill if you surprised them with these! Where did you get the little shoes? Hi Donna! You will use the black construction paper to make the shoes. You can hand draw them or try to find a printable online! so cute. how did you make the little shoes? That is so cute! Thanks for making me smile! Thank YOU for making me smile with your kind comment! 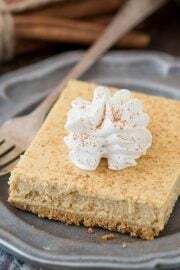 Love how you’ve taken a fairly ordinary dessert and made it into something fabulous and Halloween-themed! Thanks Nicola – I wanted to create something that was easy to make and fun! i made pudding, not the instant kind, after cooking I added 1 teaspoon of pure peppermint extract and six drops of food coloring; I let the pudding cool completely before assembling, I also used mint Oreos. Oh, yum. Ruth, that sounds delicious! Thanks for coming back to let me know how it went! Very Clever and fabulous! So delicious and fun! I made these for friends’ who came last night. They went over very well. I did make some changes, used cooked vanilla pudding and added the food coloring while hot then cooled the pudding. 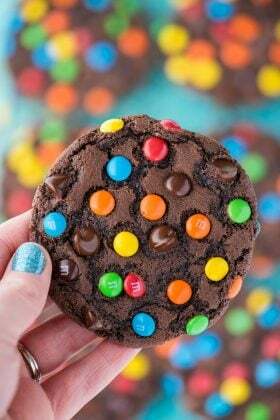 I only used the Oreo cookie crumbs, not the brownie. I also used Cool Whip instead of whipping cream. I also used a single edge razor blade for cutting the straws. Charleen, I am so glad they were a hit! And what a bonus, one for breakfast, yum! !